Don't forget to see our best pictures on the Pictures page ! A video is coming soon ! Articles and interviews of the week ! 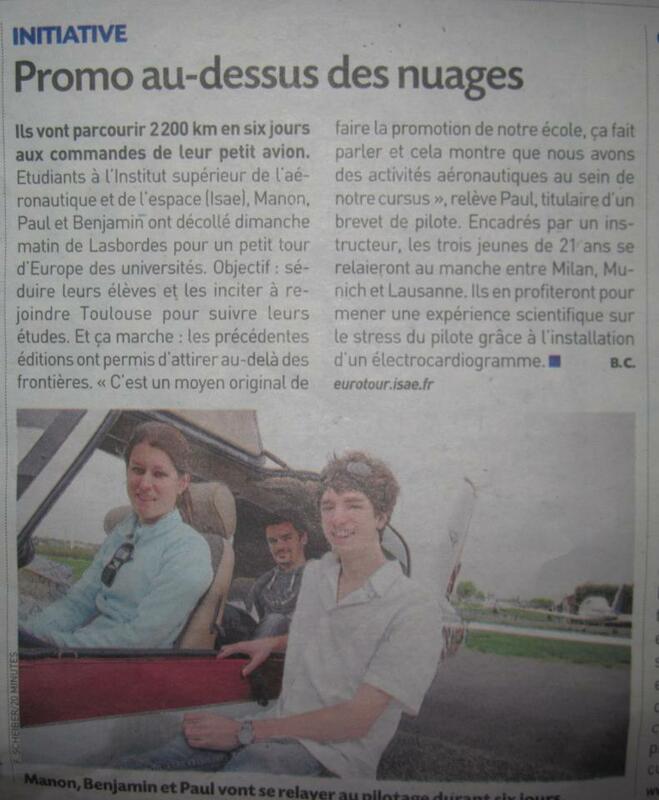 During our trip, some newspapers wrote articles about the Eurotour 2013 ! "Welcome back Alpha Oscar, cleared to land runway 16!" By reading this post, you can easily guess that we managed to take-off from Lausanne airport safely. We managed to be at the Airport before 8 am, so the temperature was still low enough to help us to get airborne. The arrival at Lasbordes airfield was a little tricky, since the wind was blowing between 30 and 50 kts, pushing us away from the runway axis. But the TB-20 made it to the ground with no trouble. The time has come for us to rest a little(2000 km within 5 days...), and to process and analyse the data we gathered during the on-board experiment. Such a project would have been impossible without the help of Daniel Vacher, our safety pilot, whose advice to us have been unvaluable. We would like to thank the Société Générale, the 3AF, the ISAE, the CEI and the Com' Department, for the help they provided during the planning and preparation of the Eurotour. Huge thanks to Politecnico di Milano and the EPFL, where we really felt welcome! We have been waiting for it since last Sunday, and here comes the sun at last ! Shortly after we took off from Annecy, we headed North East, in the direction of Salanches. From above the valley, the view was just amazing: the Mont Blanc had never seemed so close. We also reached the highest altitude since the beginning of the Eurotour, up to 11500 ft! A couple of minutes later, it was time to begin the descent as the Lac Leman was in sight. The transition between the moutains and the lake was a breathtaking moment. However, there might be a snag with our departure: Lausanne is 2000ft above sea level, the runway is steep, and only 795 meters long: an early departure is therefore mandatory if we want to take off within the runway limits! This morning, we had to erase Munich from our flight plan, mainly because off the bad weather conditions. Fortunately, we managed to change the date of our conference in Lausanne, re-scheduled on the 24th. Nothing seems to go as planned! However, the Alps were still standing between us and Switzerland. Because flying over the Alps was not an option, we chose to go back into the French airspace. We refueled at Carpentras , and continued our journey along the Alps, until we reached Annecy, where we are right now. Lausanne is now only 30 minutes away, with no risk of heavy weather until Thursday. Nothing would have been possible without 3AF.